In a matter of days the Most Comprehensive Origins of Cliches set will all be available! About nine years ago I set out on an exciting journey which I had no idea would carry me this far. I began researching and recording cliches, idioms, proverbs and curious expressions used in the English speaking world, and the most likely time and way they were coined. After publishing two small humerus books titled On the Origin of the Cliches and Evolution of Idioms, a pun takeoff on Darwin’s work, which sold many more copies that I expected, one of my cousins said, “You may have something there!” I could see I was barely scratching the surface, because so many more sayings were being brought to my attention daily, so my work continued. In 2013, I published a large volume I called “Most Comprehensive Origins of Cliches, Proverbs and Figurative Expressions“. I thought this would end it. But it was declared by Amazon a “Hot New Release” and began to take off, selling far more than the small books. It ended up in numerous public and University libraries across America and brought much acclaim from professionals like college professors, high school and elementary school teachers, pastors, newspaper reporters, librarians, authors, etc. It was even referenced in a thesis at Vanderbilt graduate school by a PHD applicant. Once again I could see my work was far from complete, and thus I released a second Volume, and now the third and truly final Volume is coming out, along with a 200 plus page index book tying together all three Volumes for rapid location to all 4,000 plus entries. The three volumes of entries without the Index Book total over 2,500 pages in small print. Revised editions of the first two are already out. Early in November the third Volume and Index will also be on Amazon. Anyone who wants to pre-order the new books, signed by me, may do so by emailing me at stan@stclair.net for details! How many idioms start with ‘On’? I haven’t been doing a lot of blog entries or even posts on the St. Clair Publications Facebook page lately because every available minute is being used to wrap up my 10 year project of collecting, researching and publishing popular English idioms and proverbs: things we say everyday and would like to know how long we’ve been saying these things and why. It has been a thrilling ride, and a very time consuming one. Right now I’m not only working on getting the final edits into Volume II of Most Comprehensive Origins of Cliches, Proverbs and Figurative Expressions, but simultaneously I am ‘getting out the kinks’ of the first three by eliminating duplicates and making an Index Book to tie the project all together. When this is complete, someone who owns all three of the latest versions and the Index Book can look up any entry in the Index and go straight to it, without trying to guess which book it may be in. And there are almost 4.000 entries! It seems that multiple entries begin with almost every common word. I just finished with the Os in the Index, and there are 29 entries beginning with the word ‘On’. Here are some of them: On message,On one’s toes,On pins and needles, On shaky ground, On someone’s back, On someone’s dime, On someone’s doorstep, On the blink, On the button, On the edge of someone’s seat, On the flip side, On the fence, On the heals of, On the hot seat, On the off chance, On the lam, On the level, On the other hand, On the QT, On the rocks… You see what I mean.. and the list goes on. But if you only own the Original Volume (as thousands of folks do) you only have nine of them! That’s why it’s so important to own them all!. And a signed copy of Volume III can be pre-ordered right now by simply emailing me at stan@stclair.net, then sending a total of only $25 via PayPal to stanstclair46@yahoo.com . Don’t send a PayPal to stan@stclair.net! I won’t get it! It will be released soon! This is the only detailed encyclopedia of origins of sayings in the world. Other books don’t go this deep, and a lot of online information is incorrect! Revised copies of the first two Volumes will soon also be out, then the Index! Well, it happened again! Thank you! It was great to see that in addition to 5 other copies of my popular book, Most Comprehensive Origins of Cliches, Proverbs and Figurative Expressions which sold yesterday on Amazon, one individual ordered 17 copies! That happened about a year or so ago when someone ordered 19 copies at the same time. It may be the same person…but I would expect it is a teacher, professor or school ordering them for a class, since I know it has been used as a text book to help teach English as a second language. I am very grateful for this, and feel honored! But only one copy of the second volume sold yesterday. Of course all purchases are appreciated, but I can’t help but think about all those people who have, and use, my original volume who are missing out on the 1000 + additional entries in the second one which were researched just as meticulously as the others and would improve their library of phrase origins and meanings! So… If you have the first one, whether you bought it yourself, or received it as a gift, I know you would love Volume II! get your copy today on Amazon or the St. Clair Publications website! The year on this photo gives it away. This is Rhonda and me on a lake cruise on Lake Mead near Las Vegas on the Arizona Border. This was the second time I had visited Vegas and been to Hoover Dam. It’s a lovely place and everyone should go at least once. This is a term used for a modern trend by users of social media sites such as Facebook, Twitter and Instagram when posting or reposting old photos. According to an article in Sports Illustrated Magazine, August 22, 2013, ‘From Hardwood to Hashtag: How NBA Culture Gave Rise to Throwback Thursday’ the term was coined on a blog named ‘Nice Kicks’ about sneakers in 2006. Stay tuned for my announcement of the early release date! 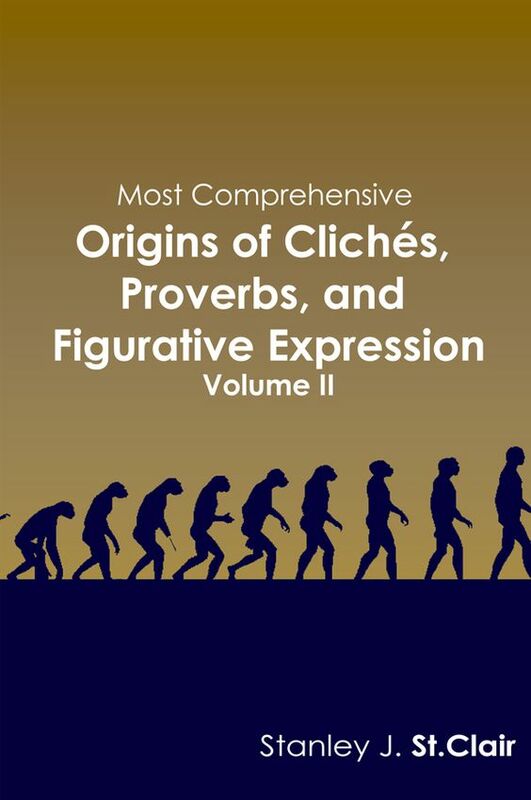 I have received most of the edits now on the second volume of Most Comprehensive Origins of Cliches, Proverbs and Figurative Expressions, from my editor, Kathy Barney, and the balance will quickly follow. I am staying busy incorporating the edits into the master manuscript, and all is on schedule for the promised October 1 launch. First peek at the new book front! In just over three months the new Most Comprehensive Origins of Cliches, Proverbs and Figurative Expressions Volume II containing over 1,000 brand new entries will be released. It is with the editor being polished up, and today I am posting the first look at the front cover! It has many hundred new Americanisms, a few hundred British idioms, and quite a few which are exclusively used in Australia and New Zealand. It has numerous proverbs and quotes not included in the original or its revisions, and even a few oxymorons which have become cliche. Stay tuned to my blog for updates.